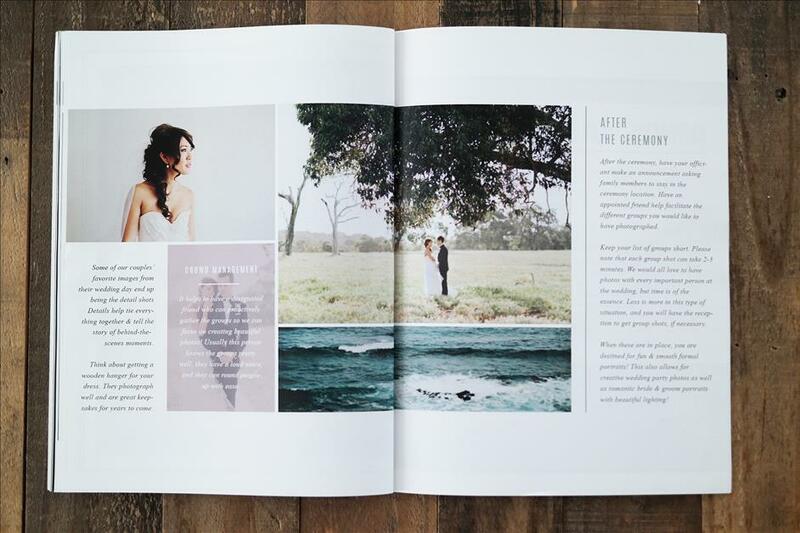 Branding for Photographers: Custom Designs or Marketing Templates? Whether you have a thousand photo sessions under your belt or you are just getting your feet wet in the photography industry, having a brand that is memorable and true to your style is just as important as taking high quality photos. 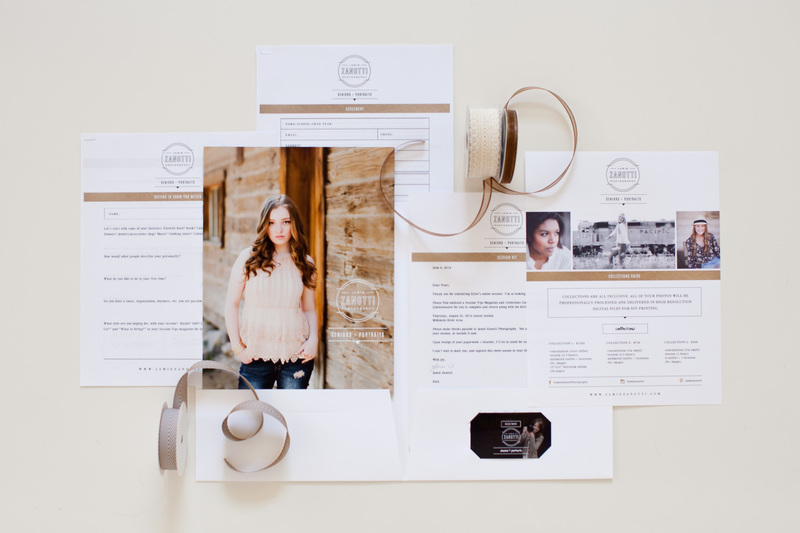 If you love spending time behind the camera but feel overwhelmed when it comes to creating the perfect marketing materials, you are not alone! The branding process can sometimes be daunting. Where do you start? How much should you spend? Fortunately, there are great options and resources available to help you get started. Similar to purchasing a home, the most important thing you can do for your brand is to start with a solid foundation. Your “architect” (your designer) will carefully craft a blueprint that will house the story of your business as it grows and evolves. YOU get the fun job. You get to be the interior designer: picking out the perfect hues, fonts, and finishing touches that cater to your individual style. 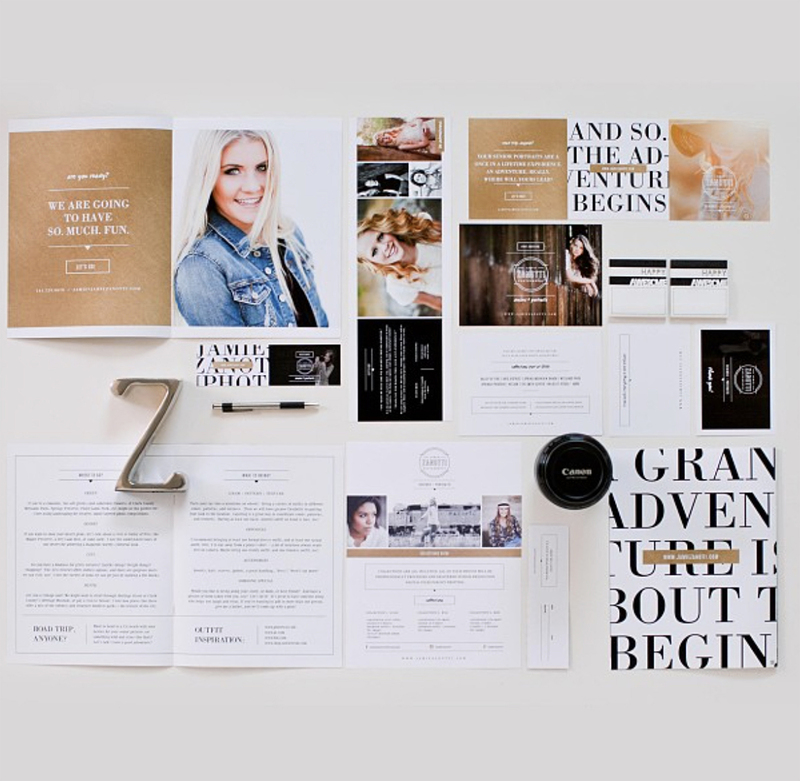 If you’re the type that wants to see how something looks before deciding on “the one,” pre-made branding materials might work well for you. If you want unique illustrations or a website that functions in a specific way, it might make more sense to commission a designer for a custom branding experience. 1. They’re more affordable. Pre-designed materials are considerably less expensive than custom design. If you are just starting out or are on a strict budget, this is a great option that will allow you to find your voice as your business evolves. 2. You can make updates easily. Since you’re working within a template, it’s easy to change colors, text, and images whenever you’d like. 3. It’s faster. In a hurry? If you’re purchasing pre-designed templates, there is no need to wait for a designer to create your materials. 4. What you see is what you get. There are no surprises when it comes to quality, as you can preview the designs before purchasing. 1. Your branding won’t be one-of-a-kind. Design templates are sold more than once, so you’ll need to customize your materials further to get a truly unique look. 2. Cohesiveness will be a challenge. You might like a business card layout from one designer and a pricing guide from another, making it harder to create consistency within your brand. Consistency is an important factor in creating brand recognition. 3. Editing your materials may require specific software. Most templates are created for Photoshop or In-Design, so you’ll need access to this software to update the files yourself. 1. Exclusivity! Working with a designer allows you to create a look that is completely unique to you and your business. No one else in your market will have the same look, which can help to set you apart. 2. You can create a seamless brand. 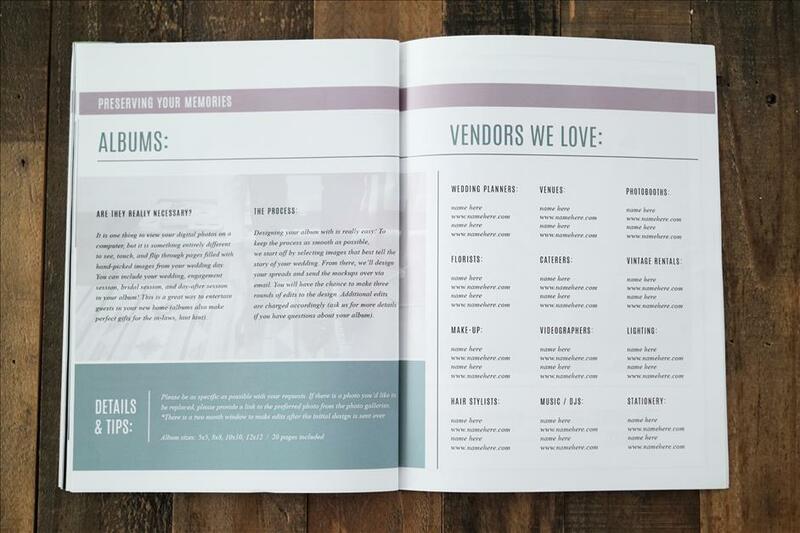 From web to print, your materials will look consistent across the board. If you struggle with piecing things together, your designer can help you to create elements that work well with one another. 3. There are no software requirements. You won’t need any specific software to create your branding elements, as your graphic designer will take care of this for you. 4. You can outsource all of your design needs. Not everyone is a designer, and that is perfectly okay! 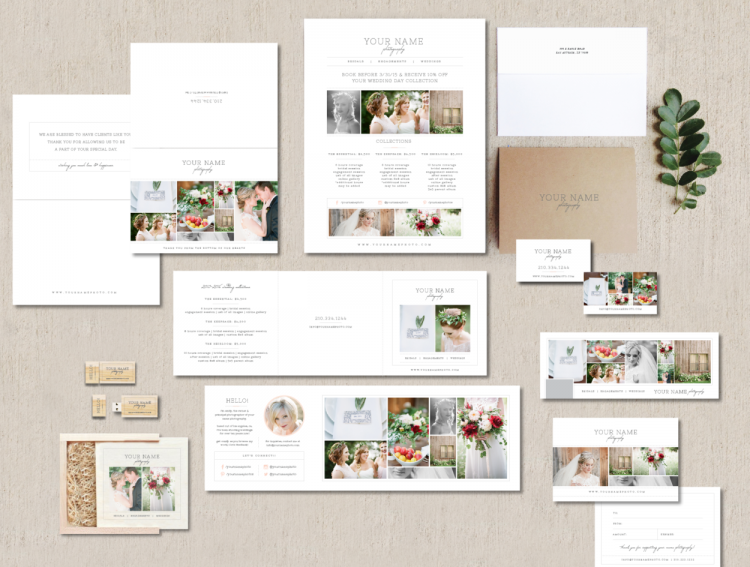 Clients hire you to capture their memories, not to create your own business stationery. 1. The investment is larger. Custom design often comes with a significant price tag. Branding projects usually range between several hundred to several thousand dollars. Make sure the quality of the design reflects the price tag that comes with it! 2. You may rely on your designer for revisions. If you want something updated or require more materials, there could be a need to go back to the designer for help. 3. The process takes time. Depending on how many revisions you require, you can expect to go back and forth with your designer for several weeks, if not months. Whether you find the perfect pre-made marketing set or hire a designer to create a custom brand, be sure to stay true to yourself. 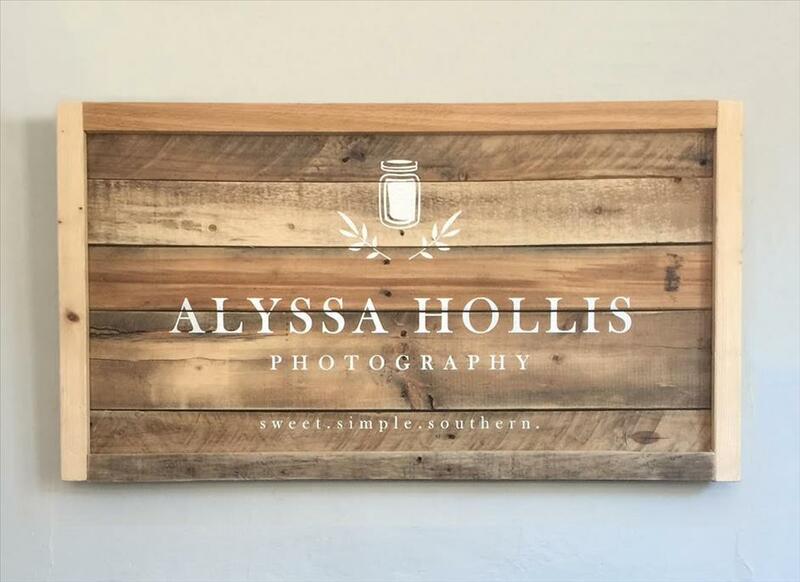 The way you present yourself to clients is the most essential asset your brand can ever have! Bittersweet Design Boutique provides photographers with unique marketing materials and Photoshop templates that allow creative professionals to market their work beautifully and expand their line of products. Find out more by visiting their website, www.designbybittersweet.com. How do we enter to win a brand makeover? Wow this is very eye opening!! Hi there! For a chance to win, enter your email address in the form above. Thanks! Thank you. I apologize. I didn't see that form on my mobile platform. Not sure if it didn't show up, or if I just missed it. Either way, I entered from my computer just now. Thank you! Your entry form for the contest isn't working from mobile devices. Wonderful information! I'll attempt to enter the contest from my desktop. This is so great! Thank you for the advice!